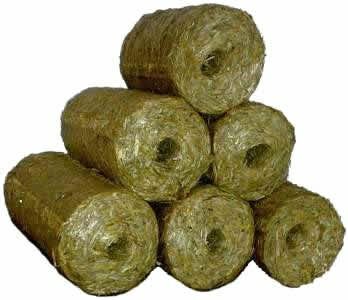 Cellulose for industrial use is mainly obtained from wood pulp and cotton. Some animals, particularly ruminants and termites, can digest cellulose with the help of symbiotic micro-organisms that live in their guts, such as Trichonympha. 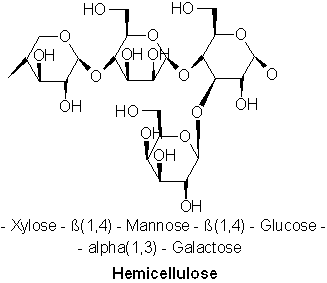 In human nutrition, cellulose is a non-digestible constituent of insoluble dietary fiber, acting as a hydrophilic bulking agent for feces and potentially aiding in defecation. Cellulose was used to produce the first successful thermoplastic polymer, celluloid, by Hyatt Manufacturing Company in 1870. Production of rayon ("artificial silk") from cellulose began in the 1890s and cellophane was invented in 1912. Hermann Staudinger determined the polymer structure of cellulose in 1920. The compound was first chemically synthesized (without the use of any biologically derived enzymes) in 1992, by Kobayashi and Shoda. The arrangement of cellulose and other polysaccharides in a plant cell wall. Cellulose is the raw material in the manufacture of nitrocellulose (cellulose nitrate) which is used in smokeless gunpowder. Levoglucosan Deoxygenation via Elimination and Cyclization within Molten Biomass". Energy & Environmental Science. 5 (7): 7864. doi:10.1039/C2EE21305B. ^ Gibson LJ (2013). "The hierarchical structure and mechanics of plant materials". 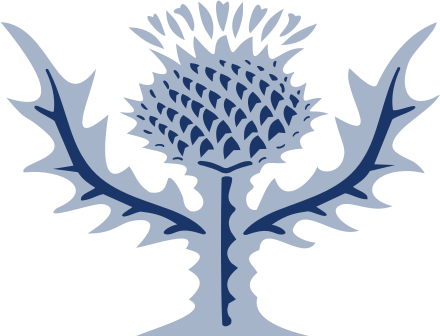 Journal of the Royal Society Interface. 9 (76): 2749–2766. doi:10.1098/rsif.2012.0341. PMC 3479918 . PMID 22874093. ^ Weiner, Myra L.; Kotkoskie, Lois A. (2000). Excipient Toxicity and Safety. New York: Dekker. p. 210. ISBN 0-8247-8210-0. ^ Dhingra, D; Michael, M; Rajput, H; Patil, R. T. (2011). "Dietary fibre in foods: A review". Journal of Food Science and Technology. 49 (3): 255–266. doi:10.1007/s13197-011-0365-5. PMC 3614039 . PMID 23729846. ^ Holt-Gimenez, Eric (2007). Biofuels: Myths of the Agrofuels Transition. Backgrounder. Institute for Food and Development Policy, Oakland, CA. 13:2 "Archived copy". Archived from the original on 2013-09-05. Retrieved 2013-09-05. "Archived copy". Archived from the original on 2013-09-06. Retrieved 2013-09-05. ^ Hobgood Ray, Kathryn (August 25, 2011). "Cars Could Run on Recycled Newspaper, Tulane Scientists Say". Tulane University news webpage. Tulane University. Retrieved March 14, 2012. ^ Balbo, Laurie (January 29, 2012). "Put a Zebra in Your Tank: A Chemical Crapshoot?". Greenprophet.com. Retrieved November 17, 2012. ^ "Zeoform: The eco-friendly building material of the future?". Gizmag.com. Retrieved 2013-08-30.